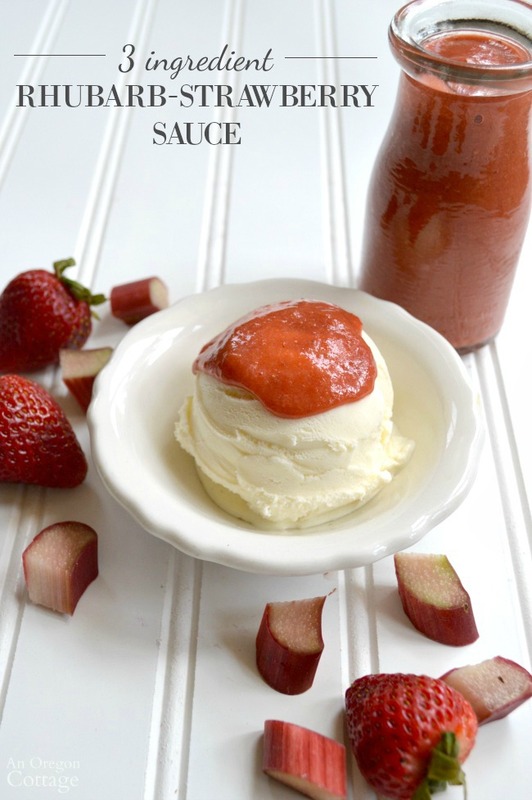 Fifteen minute, 3-ingredient rhubarb strawberry sauce is a slightly sweet, mostly fruit sauce that’s a refreshing topping for desserts like ice cream and pound cake, as well as spreading on breakfast foods or to freeze for later. 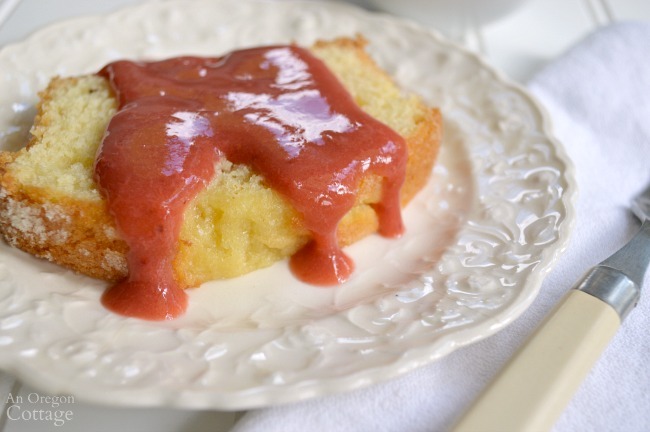 When you’ve got rhubarb and strawberries coming in – from a garden or from the market – and you’ve made cakes, crumb bars, jams, and chutneys, this healthy, slightly sweet sauce will be another way you’ll want to use & preserve this seasonal produce – it’s such a wonderful flavor on so many things! 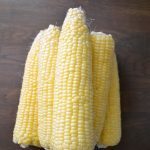 And since it’s done in about 15 minutes – start to finish – and freezes beautifully, this is a recipe for your preserving file that I think you’ll be using again and again for a bit of that summertime taste in the middle of winter. Rhubarb and strawberries are a classic summertime combination, and this is no different. I’ve kept the sweetener deliberately low in order for the flavors to shine through. The sweet strawberries balance the tart rhubarb pretty perfectly in my opinion, though if you’re looking for a sweeter sauce it’s easy to increase the sweetener. 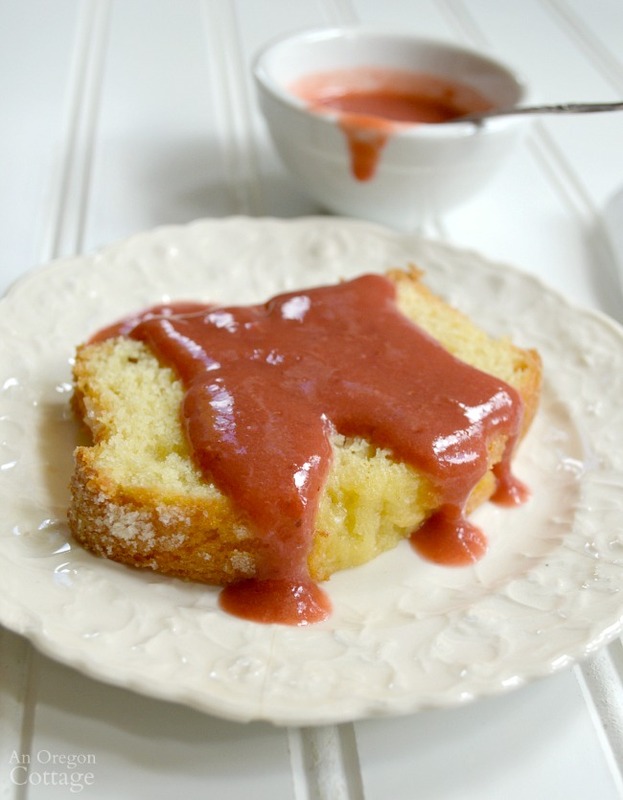 Ideas for how to use this easy sauce (besides eating straight from the spoon…) include topping vanilla ice cream (so good) and as a sauce for pound cake – lemon pound cake is especially good. It’s also terrific on waffles, pancakes, and just spreading on toast as a low sugar “jam.”I seriously love toppings like this that make things seem extra special, but actually are pretty good for you. So, is it really just three ingredients? Yep- although I’m not counting water (is it an ‘ingredient’ when we all have it all the time?). It’s basically equal amounts of fruit and just a small amount of sugar. In the photo above the sweetener is coconut palm sugar (which contains less fructose than regular sugar so I like to use it when possible). Any sugar will work with this, though, since it’s the fruit that provides the thickening. Even honey or maple syrup are okay, though they will impact the flavor a bit more. And is it really just 15 minutes? Actually, it may be slightly less, depending on how quick you are at cutting the friut! 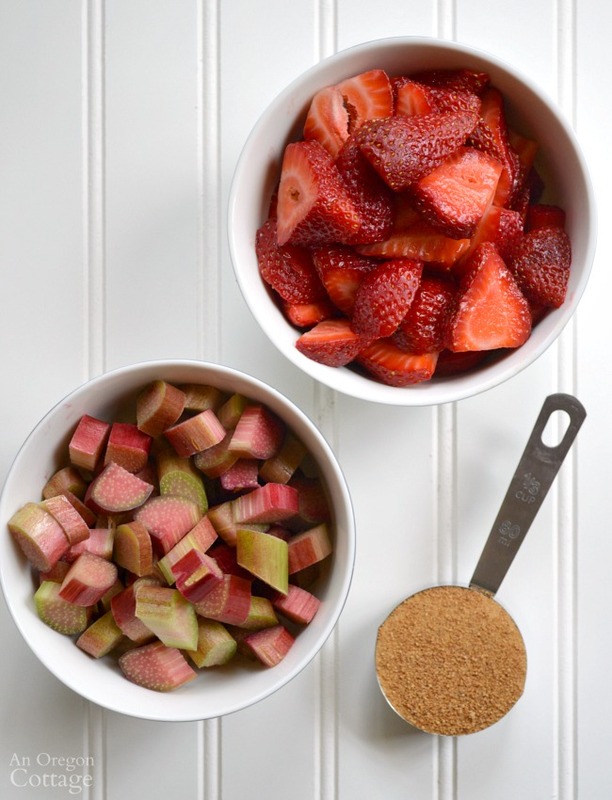 Cook the rhubarb and sugar with water and when the rhubarb has softened, add the strawberries. Then use an immersion blender (which is an essential tool in my kitchen!) 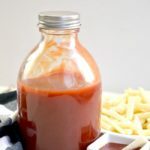 for a super easy way to puree the mixture into a smooth sauce. The other method is to transfer the mixture to a blender, being careful blending because the mixture is hot. And you’re done. That’s really it! You can leave it thicker to use as a spread for breakfast foods, or thin it with a bit more water to pour as a sauce on deserts. If you want to freeze it, fill freezer-safe containers (I use half-pint sized) three-quarters full – to leave room for expansion – and seal. Now that’s an easy preserving recipe, isn’t it? I’m happy to be joining more than 25 bloggers for this month’s Ultimate Recipe Challenge: Strawberry to bring you even more recipes using strawberries! 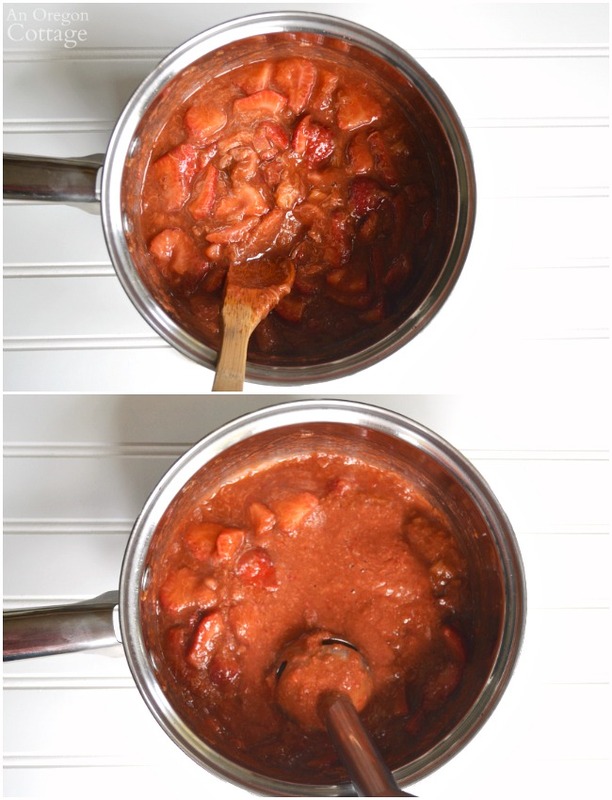 Click the arrow for the printable recipe & 25+ MORE strawberry recipes! Wow. This looks so good and is always a winning combination. I think I would love it on ice cream. I love this sauce! So quick to make too! I don’t use sugars of any kind so I will sub non-nutritive sweeteners for this. The strawberries have enough natural sugar for me to deal with.